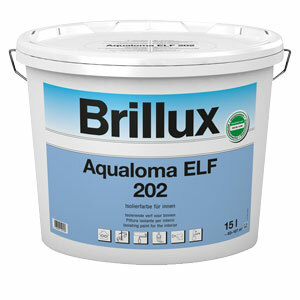 Low-emission, solvent- and plasticizer-free, low-odor, isolating paint based on an alkyd resin emulsion. Free of fogging-active substances. Water-dilutable, dull matt, good hiding power, with outstanding isolating effect on surfaces exposed to nicotine as well as surfaces cleaned of soot and oil. Reliably hides dried water spots and water-soluble, coloring components on gypsum plasterboard. Highly diffusible and very easy to apply. Does not dissolve Styrofoam. Additionally, tested for its degree of sound absorption in accordance with DIN EN ISO 354, test report no. 420001658. Bioni Nature is suitable for use in rooms where a healthy room climate and indoor air quality is desired such as living rooms and	bedrooms, hotels and restaurants. In addition it is highly recommended for use in rooms which either already suffer from mould and moisture, or which seem likely to face these threats, e.g. bathrooms and toilets. Furthermore Bioni Nature is recommended for use in rooms housing sensitive residents such as children and people with allergies, e.g. children's rooms, schools and kindergartens. By mould growth first clean with MicroKill Ag Forte, Concrobium CMSR or Serum 1000. Colour: White (other colours – contact NAC). Coverage per liter: 2.8-3.5 m2 (two coats). Bioni Hygienic is the first interior paint that has been especially developed for areas with high hygienic requirements, e.g. hospitals. 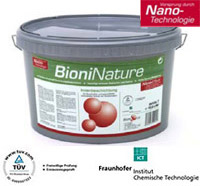 Through the use of a totally new compound of substances based on nano-silver, developed jointly with the Fraunhofer Institut für Chemical Technology, Bioni Hygienic not only provides long-lasting preventive protection from the creation of germs and bacteria but also against the formation of mould in damp areas such as showers or kitchens. Bioni Hygienic is recommended for use in areas where a high degree of hygiene is required.